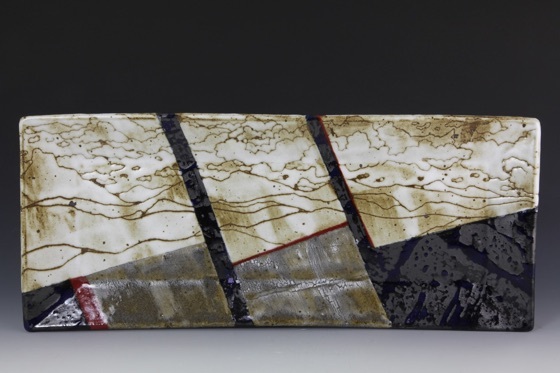 The Art Gallery at Mesa Community College, Dobson Branch, will be presenting a ceramics invitational show this winter titled Ceramic+. 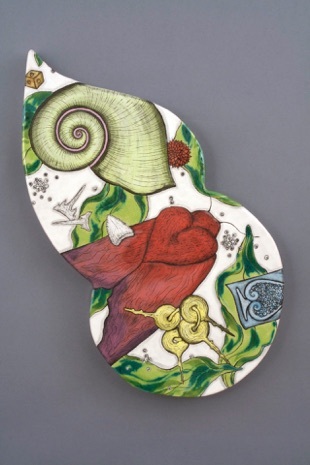 The gallery show statement: Clay. A magic material that allows you to make something out of nothing. 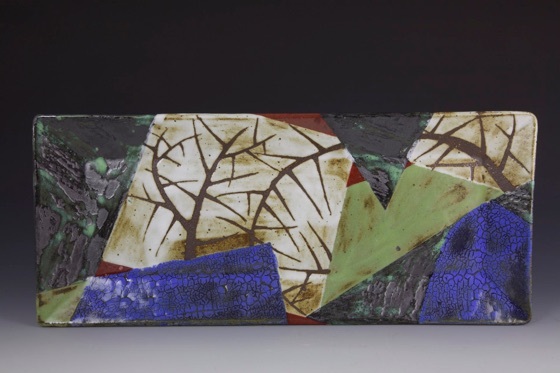 A friendly and familiar substrate, clay is a medium that mirrors what artists and designers alike do best: create a new idea or object to help, to inspire, and to communicate. 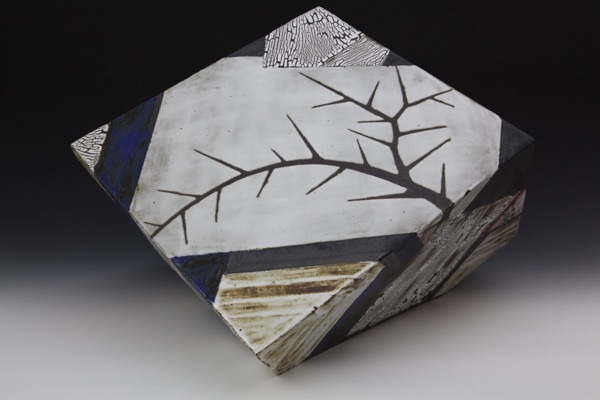 This invitational exhibition will demonstrate concepts in contemporary ceramics with work from professional, local artists using clay alone, or blended with other materials or mediums. When: November 26, 2018 - January 25, 2019. 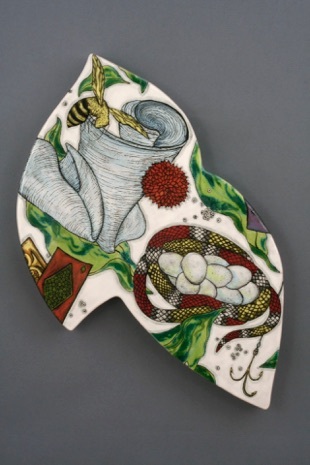 Public reception Thursday, December 6th, 6-9pm. We set up our Holiday Event in our studio workspace and showroom. We hope you can come by to enjoy the art, native landscaping, kitchen garden, hot coffee, and snacks! 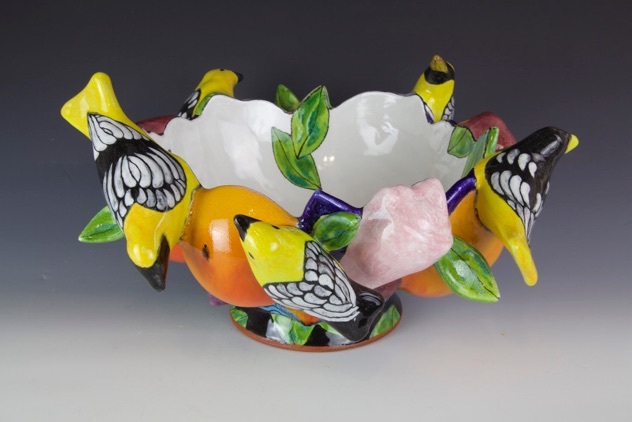 We will have beautiful work in a wide price range, with items from under $50 on up to collector level. We are delighted that you make time to visit and give us a chance to catch up with how you’ve been this past year. Garden tours for the asking! 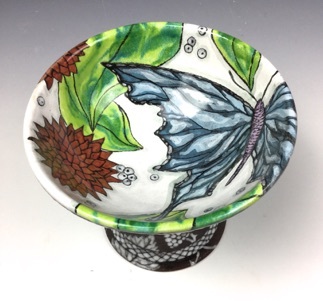 We are working on new items for the holiday event this month. 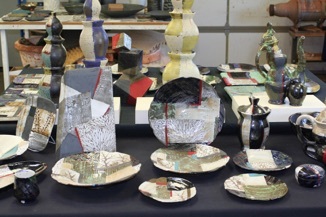 Below are photos of our work and photos of set-ups from our past holiday open studios. We have new birds-on-a-wire. 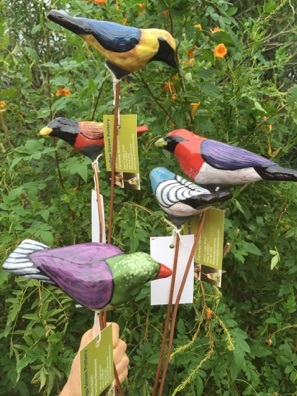 These popular items are glazed terra cotta birds epoxied to solid copper wire & meant for putting in the yard or a planter or wherever you dream up! $35 each. 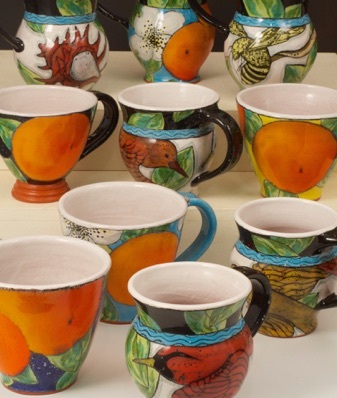 There will also be plenty of cups to choose from! In addition to using our showroom for the event, we put cloths over our studio work tables and transform our work area into display space. 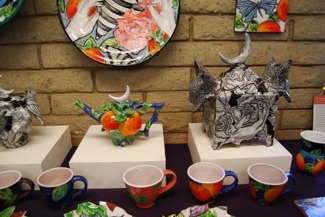 There will be a large selection of various-sized plates, bowls, cups, tiles, small and large sculptures. We hope you can come by and check it all out! 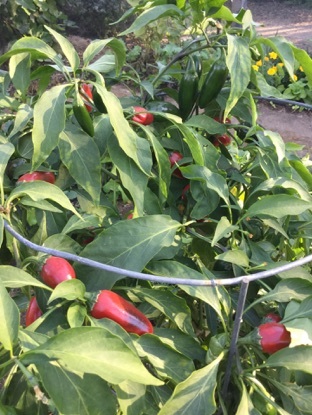 The jalapeños are ripening to red and forming a natural wreath at the top of their cage. 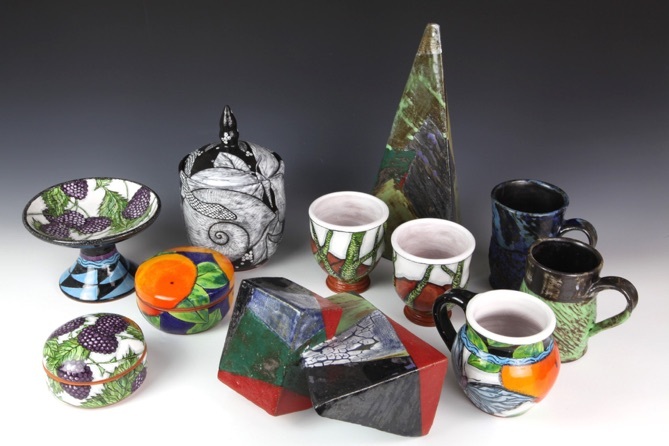 Our annual holiday studio sale is coming up soon! It will be the first two weekends of December: December 1 & 2 and December 8 & 9. 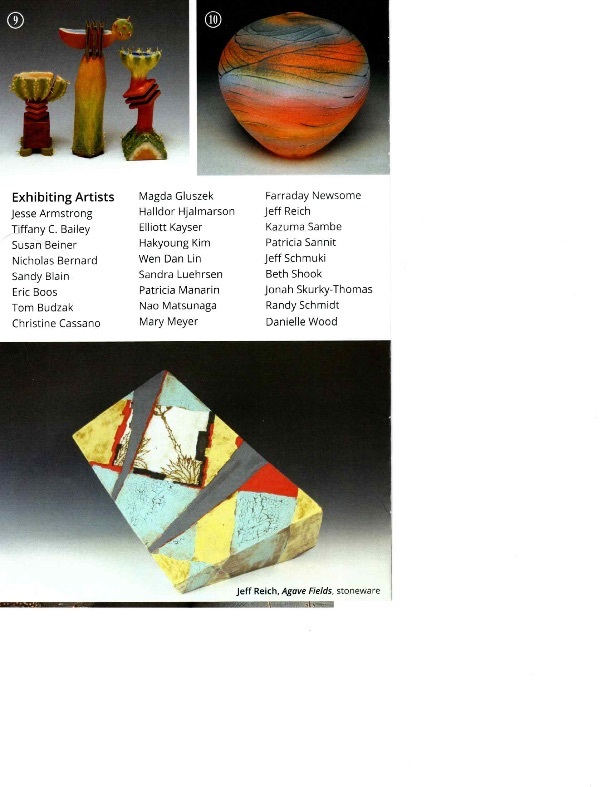 These are a few of the small works by Jeff Reich and Farraday Newsome that will be available, along with a lot more. Information, hours, location, and photos below! 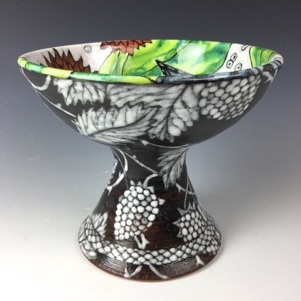 We travelled to Italy this fall and reported on our time in Venice and Florence in last month’s studio newsletter November 2018 . 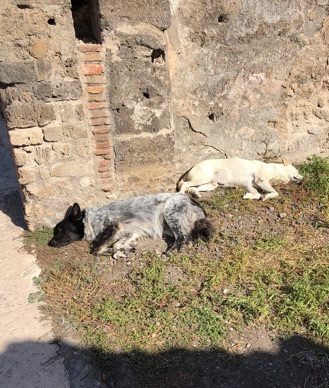 This month we are sharing photos from our visits to Portovenere, Orvieto, and Pompeii. 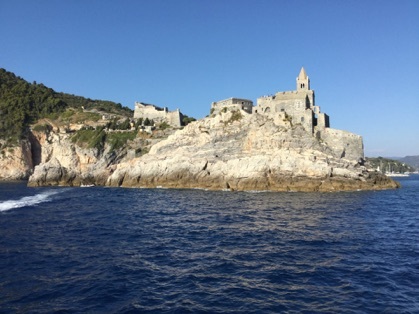 After leaving Florence we headed west to Portovenere, a coastal town on Northern Italy’s Ligurian Sea. Portovenere lies at the mouth of a large, natural bay and has a long history of defense. The photo on the left shows the old fortress and church at the entrance to the bay. The photo on the right looks through to “Byron’s Grotto”, where the English Romantic poet Lord Byron swam daily while he lived here. 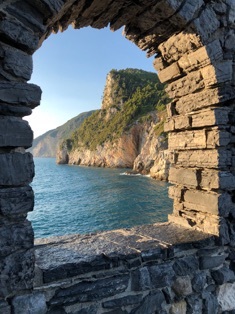 Portovenere lies just south of the famed Cinque Terre towns and is connected to them by the foot trail system that unites them all. We visited one of the Cinque Terre towns, Vernazza, by boat. We’d been warned that the Cinque Terre towns were perpetually crowded with tourists, which was why we stayed in Portovenere, and it was. 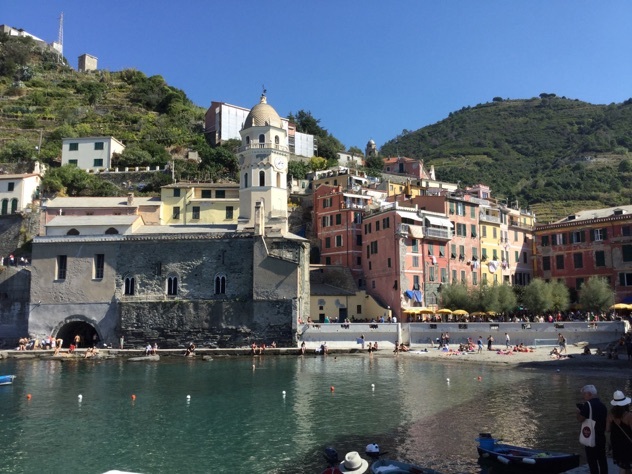 We still enjoyed Vernazza’s car-free, rustic ambience. From Portovenere we took the train south to Orvieto, an ancient hill town in Umbria, south of Tuscany. 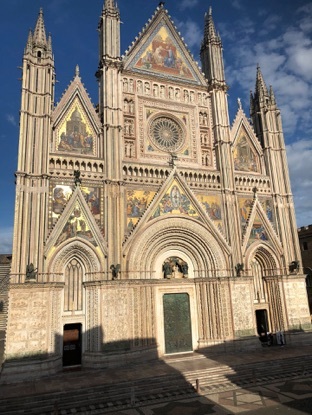 It is known for its Etruscan roots, beautiful cathedral, and tin-glazed pottery (maiolica “arcaica”) from as early as the 13th C. The photos above show the town’s cathedral, with its impressive Gothic facade and ornate interior. 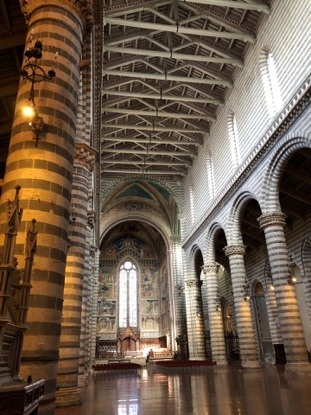 We stayed in a rental in the oldest part of Orvieto. On the left is the view from our front balcony. The land beneath our building, as with the entire mountaintop town, is riddled with centuries of labyrinthian tunnels carved through the relatively soft volcanic rock. 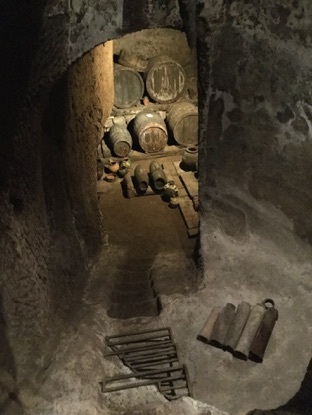 The wine cellar in the photo on the right is deep inside the “Pozzo della Cava” (“Well of the Cave”), a system of tunnels and caves whose public entrance we looked down onto in the courtyard directly below us. These two photos above are from inside the Pozzo della Cava. 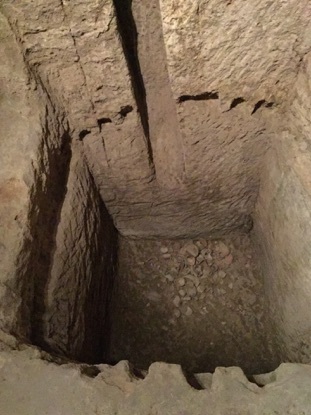 Left: One of several subterranean rubbish pits that have proven invaluable to archaeologists. 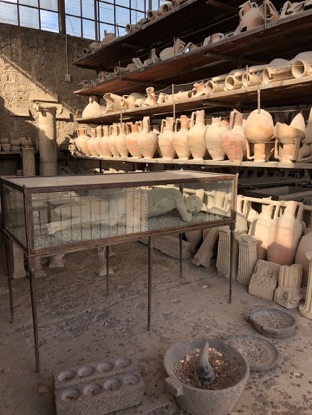 Right: The caves housed multiple kilns and have yielded proof of on-site tin-glaze manufacture from as early as the 13th C.
After a couple of days in Orvieto we took the train south past Naples and Mt. 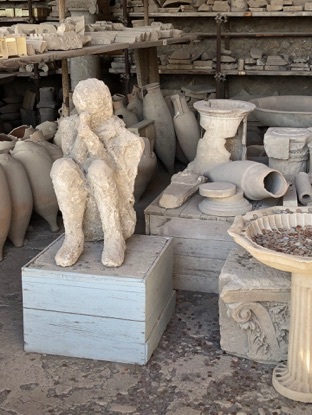 Vesuvius to visit Pompeii. We stayed in the seaside town of Sorrento and took a small commuter train aptly named “The Circumvesuviana” to get to Pompeii. 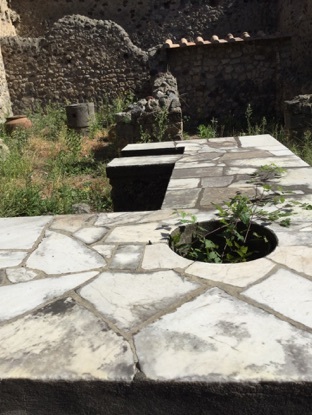 We were deeply moved by Pompeii and the scope of its tragedy. This was no small town, it was a city. The scale is almost overwhelming. It took hours to walk through just part of the vast ruin. 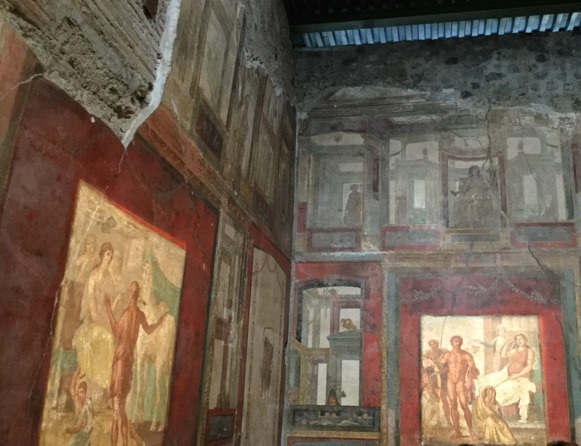 These colorful frescoes were in the well-preserved home of two merchant brothers. 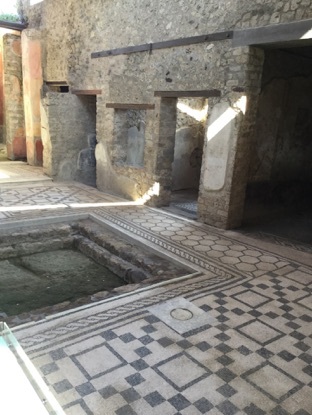 Many of the homes had beautiful mosaic floors. 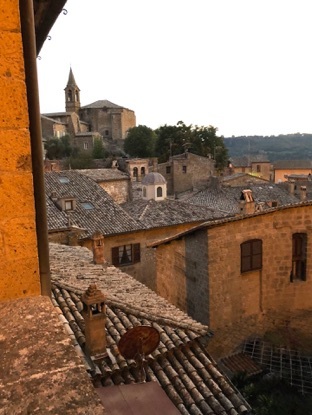 Many stone walls are well preserved too, but few wooden roofs remain due to the weight of the volcanic ash. 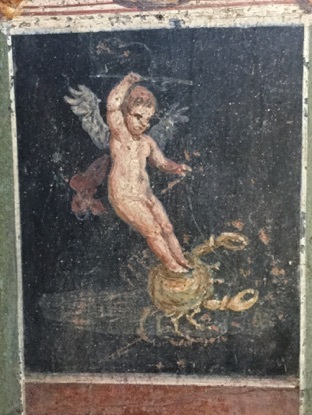 A small, lovely wall fresco of a cherub riding a little crab. 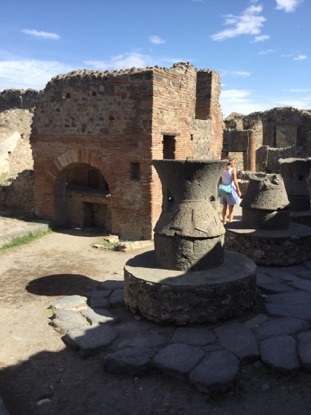 Not only are there large, public structures like the Forum and several impressive amphitheaters, but there are also the remains of life lived at a smaller scale, such as this bakery (left) with its ovens and flour grinder mills and (right) food seller’s stalls with counters and holes for pots of food. A large building composed of a series of tall, adjoining spaces was once the produce market and granary but now is the covered, protected storage area for vast quantities of archaeological objects. There are also displays of plaster casts of humans and animals who perished by suffocation after Mt. Vesuvius erupted. 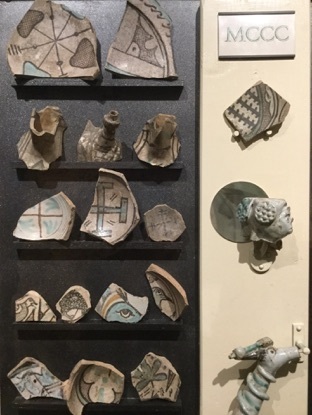 The casts were taken by filling the negative, bubble-like spaces found during excavation where remains had decomposed. 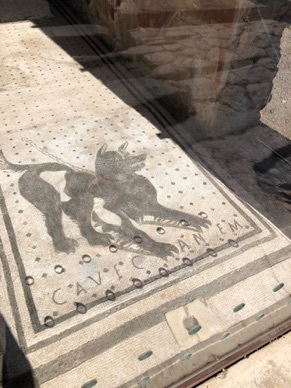 We loved this floor mosaic of a long-ago guard dog and then seeing various living dogs of 21st C Pompeii lounging about the old site and taking some sun. Although fall is becoming winter, there has been no frost yet. 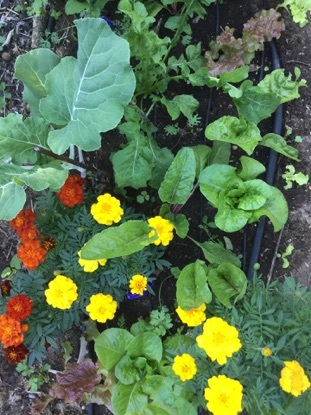 Summer vegetables like summer squash, beans, and peppers are still growing well alongside young winter vegetables like lettuces, various kales, and pak choi. 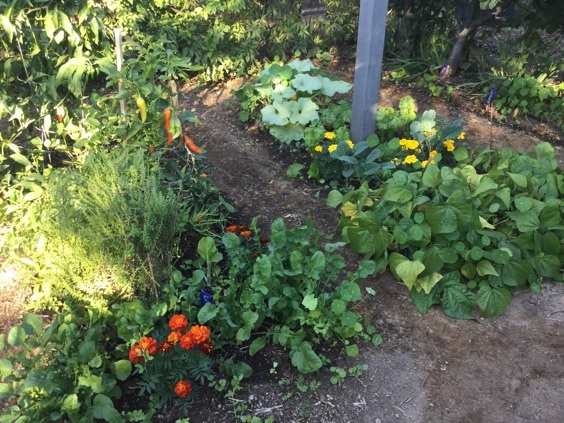 One bed has a meadow-like mix of lettuces, chard, and collards growing among yellow and orange marigolds.